This graph shows the geographic origin of the European patent filings1. This is determined by the country of residence of the first applicant listed on the application form (first-named applicant principle2). Source: EPO (for direct European filings); WIPO (for PCT filings1). Status: 22.1.2018; PCT filings for 2017 are estimates. 1 European patent filings include direct European filings under the European Patent Convention (EPC) and international filings under the Patent Cooperation Treaty (PCT). 2 In cases where several applicants are mentioned on the application form, the country of residence of the first applicant listed applies. 3 EPO states: the 38 member states of the European Patent Organisation, which includes the 28 states of the EU. 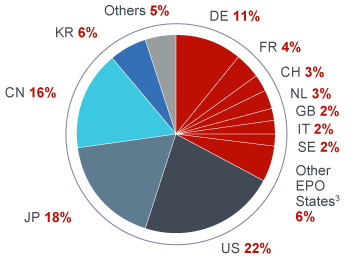 In 2017, European patent filings1 included more than 68 000 direct European filings (Direct) and around 242 700 PCT international filings (PCT). The percentage of PCT international filings has increased over the past five years.